Water features add an entirely new dimension to an outdoor environment, and they are available in an ever growing assortment of styles. The size of the area. How much space to you have for the water feature itself, and to what extent you plan on landscaping the surrounding area. The impact you wish to create. 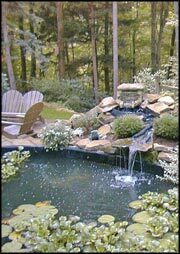 To you want a stimulating waterfall, a bubbling fountain, a koi pond, water garden, reflecting pool, stately fountain, or even a swimming pool. Maintenance that is needed to maintain the water feature and keep it in good, clean working order. There are certain fish that can help to keep the water clean, of course they will need to be fed for example. Water has been sought by humans throughout history, be it a day at the beach, a stroll along a riverbank, or a hike to a waterfall or pond. It is now becoming much easier to bring that feeling home, to your own garden in the form of a water feature.